The Clementi Mall, ROADSHOW DEALS! from 22th ~ 28th APR 2019, Mon~Sunday, 10am ~ 9.30pm. Discount up to S$100 for selected item + FREE Gift! Limited stock! First come first serve! Reverse your treatment water, tap water back to natural, finest, great tasting healthy drinking water. FREE delivery via courier service with tracking id. 7 days free returns. T & C Apply. Doulton drinking water system, Trusted by million. Doulton water provide, healthy, natural, finest, great tasting minerals water for whole family to enjoy! # What's in the box? This is enhanced with fluoride reduction cartridge reduces unwanted naturally occurring and added fluoride in the mains supplied drinking water. The TCP6 is DUAL ABS, BPA FREE housing which is extremely easy to install and uninstall, making it portable and, therefore, the ideal solution for people who move house on a regular basis. It fits to most common threaded kitchen taps via a diverter valve. Candle supplied separately. New Fluoride reduction cartridge from Doulton significantly reduces unwanted fluoride from your drinking water. Designed to reduce fluoride to safe levels in your drinking water using a specially enhanced alumina based adsorbent, which is certified to NSF STANDARD 61. The media in the Doulton cartridge is capable of adsorbing up to 3,370 ppm of Fluoride, providing protection for up to 3 months. Performance will vary depending upon the nature of the incoming water supply. For optimum performance use a service flow rate of 2L/min. Cartridge constructed with WRAS and NSF approved materials. Ideal for use with a range of Doulton ceramic filter cartridges in the Duo housing which provide additional protection against pathogenic bacteria, cysts, chlorine, taste, odour and heavy metals. Simple to install, use and maintain. No power required. Low running costs. Premium & extreme high end quality ceramic water filters. The diatom ceramic shell is fitted with an activated carbon block insert containing lead, mercury & cadmium removal media. Removal of particles, pathogenic bacteria, cysts, etc. 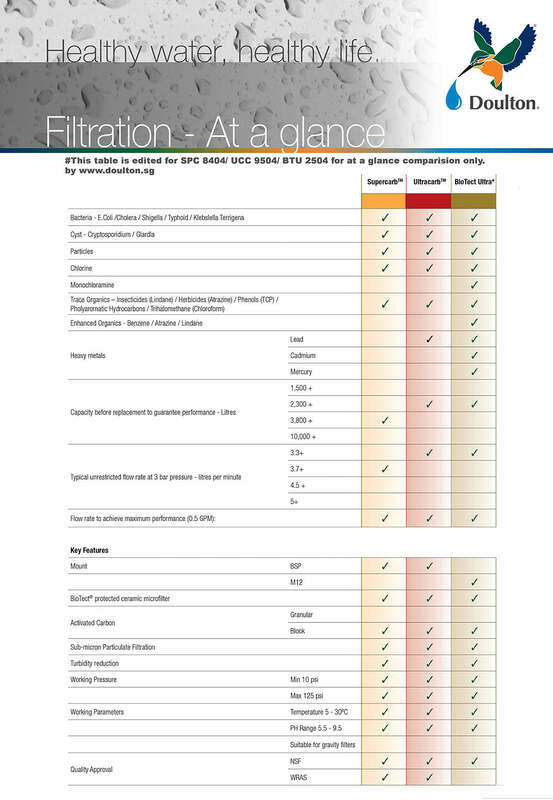 with additional chlorine, organics and lead, mercury & cadmium removal capabilities. Heavy metal: *LEAD, Mercury & CADMIUM. # Layer 1: Activated carbon, removes organic chemical & harmful radical. # Layer 3: Diatom ceramic water filter, filter power 0.2 micron removes rust & small particles. # Layer 4: Silver Ion, nano tech enhanced anti-bacteria formula properties to kill bacteria & viruses. # Layer 5: High density activated carbon block, to removes chlorine, odors taste and make water much better taste. # Layer 6: ATS exchange ions & resin to removes lead, mercury & cadmium. Britain Premium Brand, since 1826. Material : ABS, Food Grade material. # Why we should to remove Lead & Cadmium from drinking water? >> Basic Information about lead in drinking water? >> Health effects exposures mercury? *Walk in Strictly by Appointment only. Get promotion, deals & news products update! Copyright © 2019 Doulton Water Filters (SG) - Britain Premium Brand Since 1826. Doulton water filters products are manufactured by Fairey Industrial Ceramics Ltd.